Where to stay in Antalya? There are many Antalya Turkey Hotels to choose from, I chose Patron Boutique Hotel for the following reasons. You should consider Patron Boutique Hotel if you wish to stay in the old town of Antalya within walking distance of all Antalya points of interest. In addition the hotel makes a great base for taking day trips to the nearby beaches, waterfalls, Roman ruins as well as archaeological sites. In fact the reception staff will be happy to help you arrange good value day trips. For the best room rates, visit the Patron Hotel website, to view the latest pictures check the Patron Boutique Hotel Instagram feed. 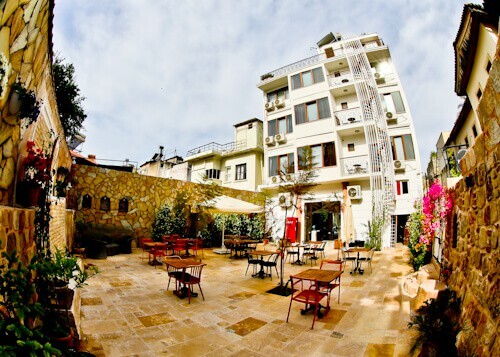 Patron Boutique Hotel is located in Antalya old town. It’s a 2 minute walk to the famous Antalya Clock Tower and 5 minutes to Hadrian’s Gate. From the rooftop terrace you’ll be able to see several of the points of interest of Antalya as well as the Mediterranean and mountains. There are hundreds of restaurants, coffee shops, fruit juice stores and bars surrounding the hotel. You’ll easily find places to eat, drink and relax whilst in Antalya. As soon as you enter the reception area, you’ll receive a homely Turkish feel. The English speaking staff will welcome you to the hotel and explain where breakfast is served and share the WiFi password etc.. In addition they’ll be able to provide you with a map of Antalya and highlight the points of interest. It’s interesting to learn about the historic tram which runs through the city. I can confirm the best place to watch the sunset from in Antalya is the rooftop terrace! 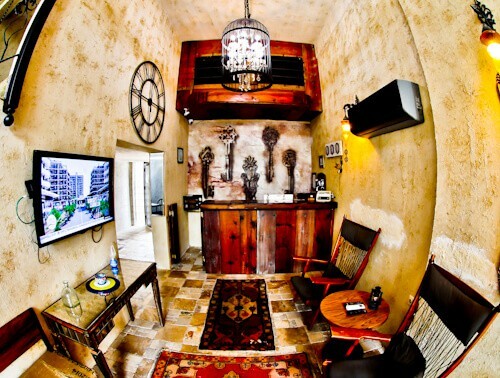 You may also wish to stop for a cup of Turkish coffee or tea in the cosy reception and watch a little TV. 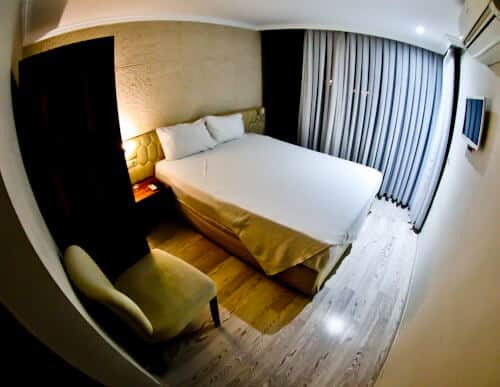 The rooms are cosy and well designed. There’s a flat screen TV and I’m sure you’ll make use of the air conditioning during the hot summer months. In addition there’s a very reasonably priced mini bar. All rooms are en suite, which include amenities, a vanity mirror and most importantly a hairdryer. The fast and complimentary WiFi works well in the rooms, as well as throughout the hotel. I recommend booking a 3rd floor room with balcony. You will be rewarded with a 24 hour view of Antalya old town and the Mediterranean. 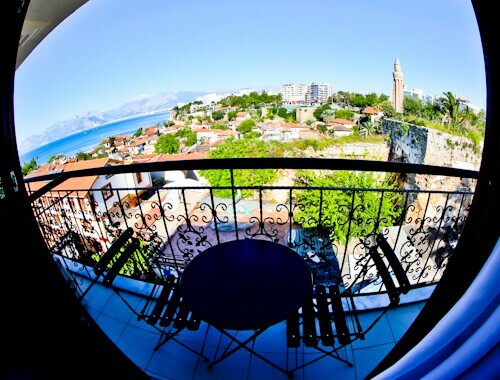 If the balcony rooms are not available, you can always visit the rooftop terrace which offer 360 degree views of Antalya! The breakfast buffet consists of fresh fruit, salad, cheese, boiled eggs, cold meat, olives, and delicious bread. All of the breakfast selection is freshly prepared, locally sourced food. To drink, you may choose from tea coffee or water. 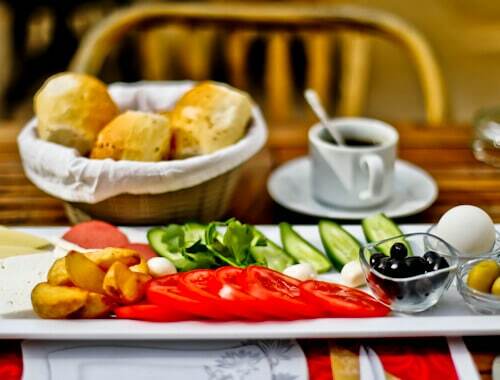 This is one of the healthiest breakfasts you’ll eat whilst enjoying your holidays. 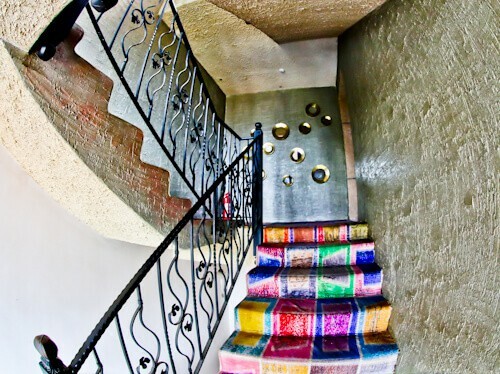 The staircase is colorful and each floor is uniquely decorated. It’s worth taking a walk around the hotel, you may be inspired by the Turkish interior design. Additionally you’ll be able to make some colorful Instagram photos and fill up your feed! Breakfast is served in the peaceful courtyard. There is something special about eating your breakfast outdoors. The high walls provide privacy but more importantly, shade during the morning and evening. In addition the running water of the fountain is very relaxing. 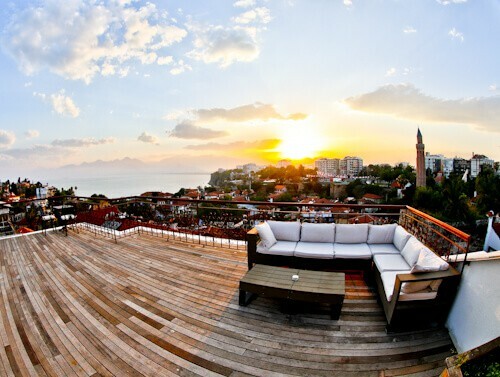 The rooftop terrace is one of the best sunset viewing locations in Antalya. Because of the elevation, you can see the sun setting behind the mountains, as oppose to the harbor which loses the sunset. 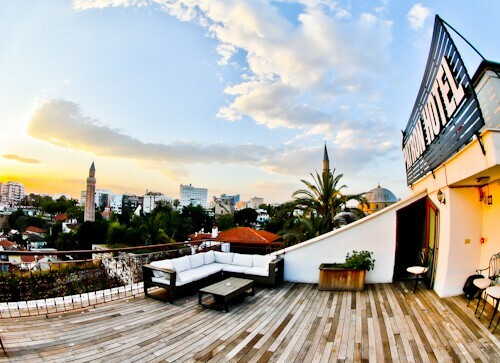 In addition you’re welcome to bring a Turkish coffee or tea to the rooftop. You can even request for a selection from the breakfast buffet to be brought to the roof in the morning. Enjoy your stay at Patron Boutique Hotel. This is one of the Antalya Turkey hotels which provides everything you need to explore this part of the world. For the best room rates, visit the Patron Hotel website, to view the latest pictures check the Patron Boutique Hotel Instagram feed. Things to do in Antalya. This hotel sounds perfect. Beautiful views from the rooftop & that breakfast does sound healthy & delicious. I’ll keep Patron Boutique Hotel in mind. Hi Shona, I’m sure you’d love the hotel and Antalya!